Beach fire Santa Cruz. Robin L. Chandler Copyright 2015. Darkness appeared in the corner of my eye. The sun dawdled splashing yellow and orange in her wake. Stars like motion detectors tracked the sun’s journey. And then suddenly, almost without warning, it was night. In the beauty of the evening it was easy to neglect the rotation and forward motion of time. Ebb tide, the waves teased the shoreline, waiting, where families danced the crescendo. On the beach friends gathered sharing stories and laughter. 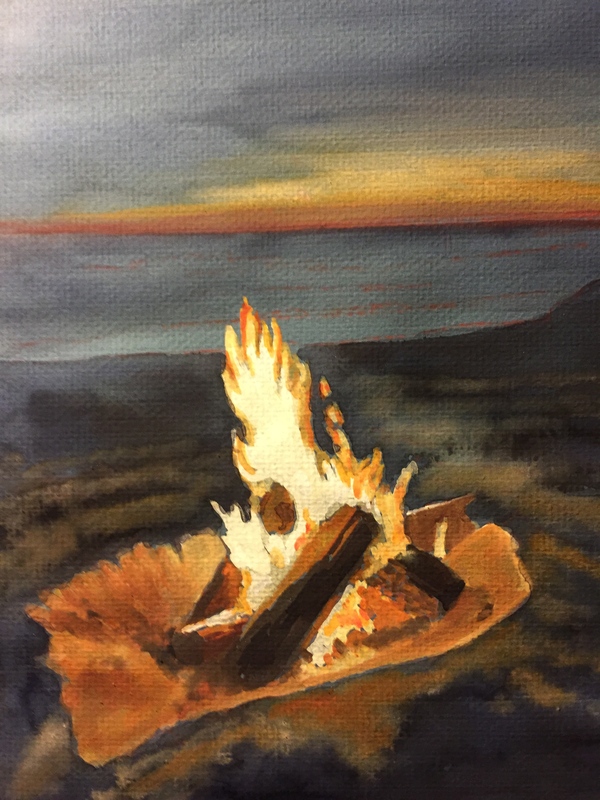 Beach fires, first flickering, grew stronger against the night sky, a shield against the darkness, a memory of color and warmth. In this context, fire is friend, a restorative. Staring into the magical flames, I reflect and imagine, a ritual connecting humankind across the millennia. But miles from here, on this summer night of the fourth year of our drought, fire crews are on the line, feverishly working to contain an inferno, capable of erasing entire communities. Difficult to believe on this calm, still night, but scientists say this pacific ocean nurtures El Nino; the infant, powerful, bringing rain and flood to wash away our sins. We live in a fundamental time; a time of powerful extremes. It is feast or famine, flood or fire; forces are in motion changing lives forever in a matter of seconds. A minor traffic violation, becomes a struggle for power; a match is lit resulting in a conflagration of unimagined consequences. Lives are ended, families devastated, and communities entrenched. And for what? How do we heal the rift and bridge the chasm?